Fiber mania hits a new high—or low, depending on how you look at it. I actually sat in bed one night last week (PJs and all) and combed some washed-but-still-manky Shetland locks to get the dirt and VM out of the tips. Though I put a cloth on my lap and attempted to keep the mess under control, there were still crumbles in the bed. Let’s hear it for spouses that understand the insanity that is fiber addiction. Yes, I do seem to luck into a lot of fiber, but it all seems to be troubled fiber. Challenging fiber. 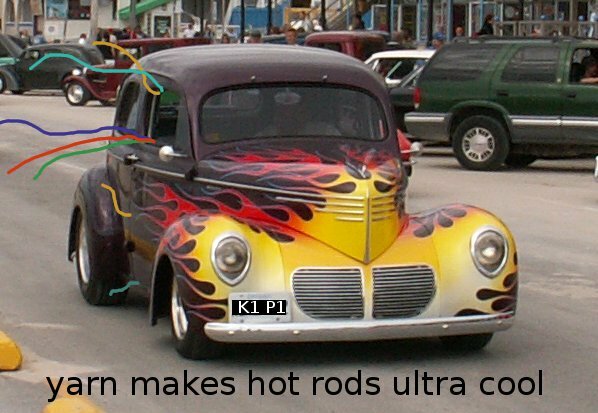 Not precisely cream-of-the-crop fiber. Take my alpaca fiber. (No, really. Someone take it off my hands.) 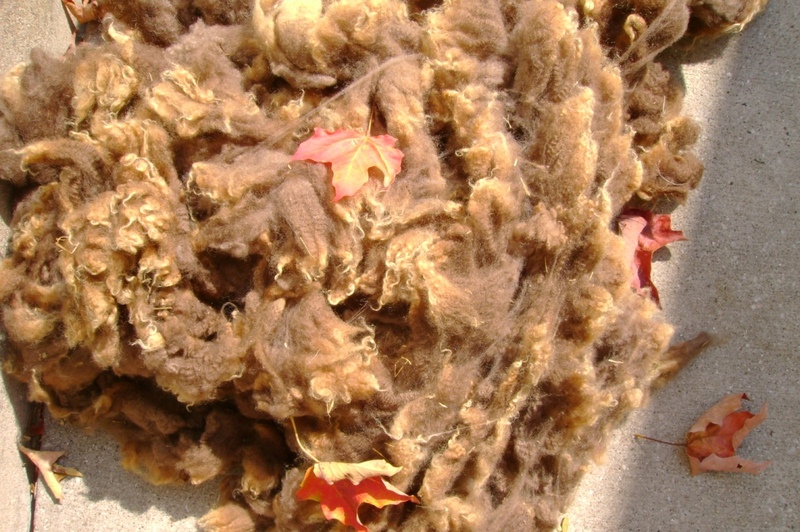 I was gifted with pounds and pounds of the softest, cleanest alpaca wool in a most interesting shade of reddish-brown. I seriously think it may be an entire alpaca fleece. Had it smelled like alpaca sweat, alpaca spit, or excrement of alpaca, I would have been delighted. But no. It smelled like MOTHBALLS. I aired the wool in net bags outside for weeks and the smell did improve greatly. Instead of being able to smell it across the room, I now had to plunge my face into the bag to detect residual mothball. But, since I’m a gal that likes to get her nose up close and personal with the wool, residual wasn’t good enough. Then I had the idea to blend it with some of my white Shetland. Yes! No smell to the yarn other than the gentle wool smell. But I wasn’t really happy with the color blend. So, next step: DYE! Here’s the before picture. 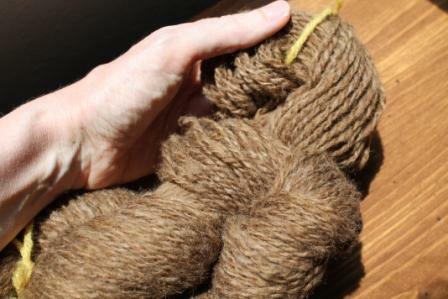 Shetland on the left, Alpaca on the right, and 3 mini-hanks of blended, quick-spun yarn. 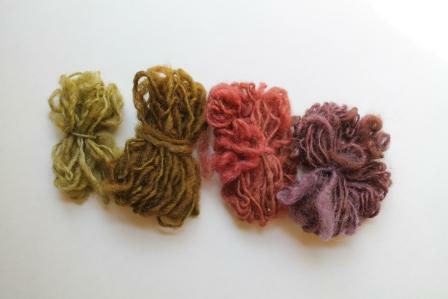 “Wait!” you say, “Why are there 4 yarn samples now?” You, my friends, are very observant! Please ignore the puny bit of green yarn on the left. That was a little white/grey yarn I stuck in the green dye at the last minute, just out of curiosity. The real show is on the right side.The red looks better in real life than it does in this photo. The purple is a bit strange looking since it turned out purple and brown. The green is not bad if you don’t mind a color like day-old guacamole. So, I don’t know. I do want to blend the Alpaca, but maybe not with white. At least my odorific Alpaca is finally useable. Until the moths show up! I don’t want to admit to how many years it’s taken me to complete two of these skeins of yarn. Suffice it to say there was a long intermission, with not enough popcorn and soda, in the middle. 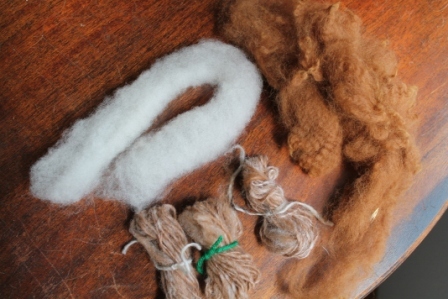 It all started with some very dirty Shetland wool that came from a sheep named Cocoa. My sister had lucked into several Shetland fleeces for $5 each, right off the sheep, and she split them with me. Note: $5 per fleece, not $5 per pound. Hard to resist, right? Now, fast forward through the washing and the hours (and hours and hours) of picking out vegetable matter. There was a reason the price was $5 per fleece. These Shetlands were more or less pets who must have had their hay dumped onto them, not next to them. 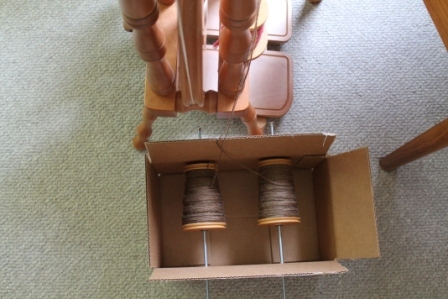 Anyway, I chose out the best bits of wool, picked, carded and spun—again, over the course of years—two ultra-full bobbins. 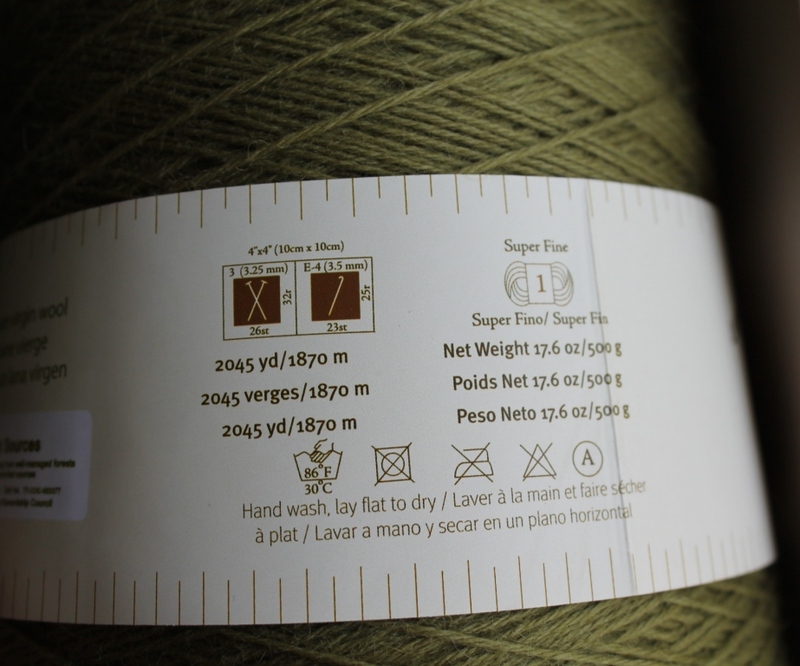 The goal: 2-ply natural brown yarn. Only problem was that I still hadn’t found a real lazy kate within my budget. And despite finding several really good plans for building a kate, nothing had materialized. Apparently it takes more than just finding the plans to make it happen. Who knew? Two size 8 steel knitting needles? Check. Tensioning device? No, but I could have tipped the box a wee bit to add a little tension. 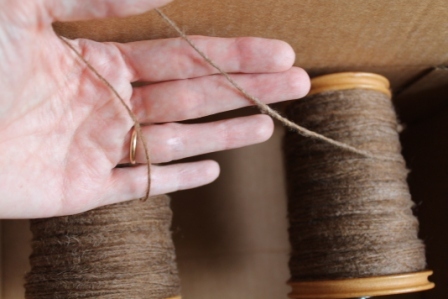 I could have also added a piece of string connecting the two bobbins with a loop to add tension. As it was, my singles were pretty thin and I wanted to avoid breakage. It’s not lovely. But it also wasn’t $50-$80 and it got the job done fantastically. Plus it’s 100% recyclable and reusable. She’s not lazy kate, she’s environmental activist kate. 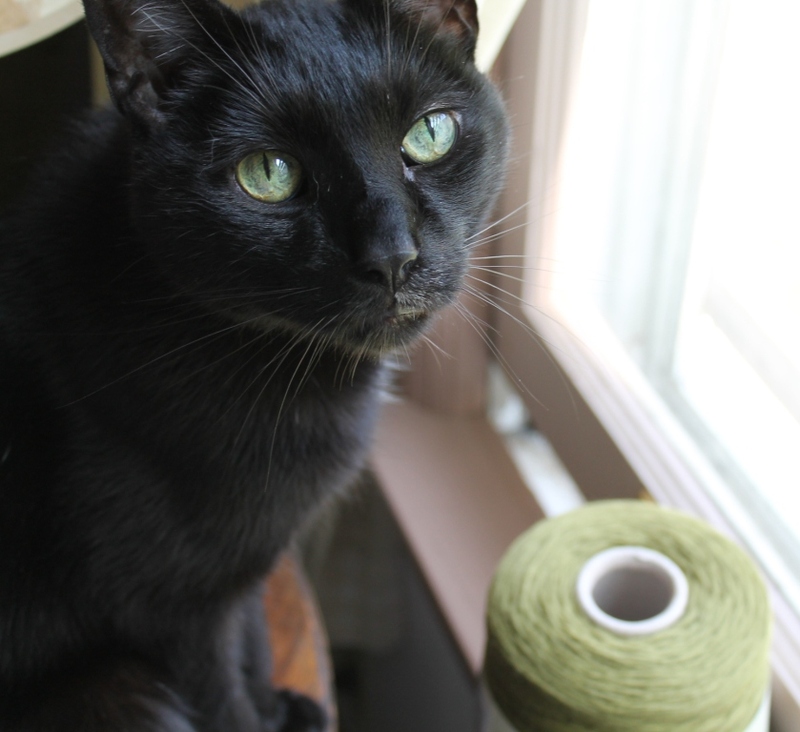 In fact, kate has issued a challenge to me: finish the next skein of yarn in less than 3 years. Like, before she falls apart. It’s been awhile since I posted pics of my sock class project, the Bosnian slipper sock. I’m getting close to the heel on this toe-up sock and I’ve hit that invisible fear barrier. The one that says, “Sure, you’ve done OK up to now (not counting starting over several times), but you’re totally going to screw up the heel.” So, I’ve been spinning some lovely brown Shetland fleece instead. If you’re thinking the toe looks weird, I would agree. It’s called a Bosnian toe (appropriate to a Bosnian sock, eh?) 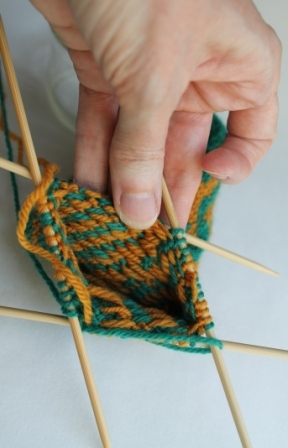 and it’s nothing more than a rectangle, from which you pick up the appropriate number of stitches on each of the four sides to start the body of the sock. As mentioned in a previous post, it’s part of a Craftsy online class called Knit Sock Workshop. Now I just need a motivation boost to get back into my class video and start that heel. What do you do to get past that fear of messing up when learning a new technique? When I saw this beauty listed on the JoAnn website, and it was on sale, AND shipping was only $0.01, I knew my Mother’s Day gift was as good as bought. Ka-ching! 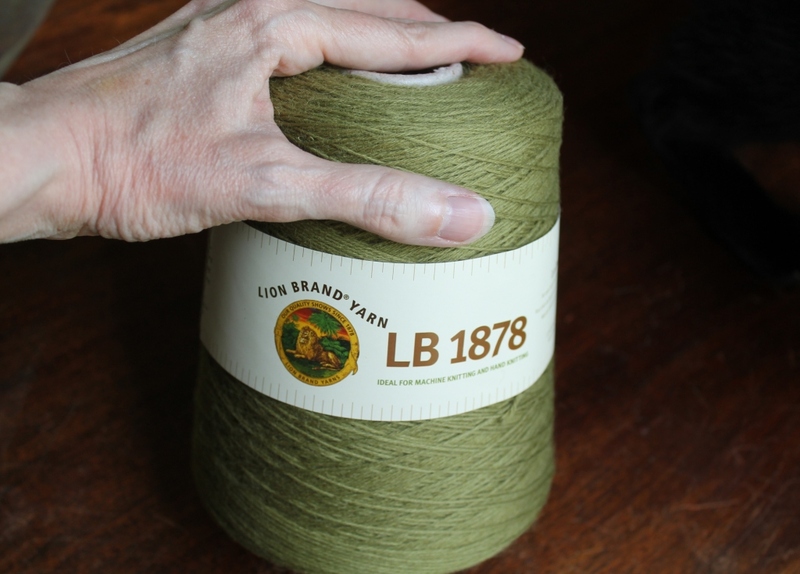 100% virgin wool yarn…Who knew it came by the thousands of yards?!? 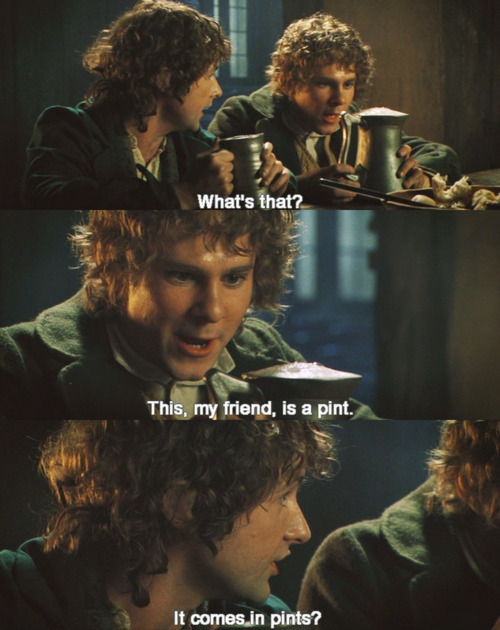 It gave me a total Pippin moment. Recently the fam sat down and made a list of needful and wantful expenses for the summer. Sadly the needful side of the list was really long. And then, last Friday, we had to add one more item when my exhaust system sprang a leak. Clarification: my CAR’s exhaust system sprang a leak. If you’ve suffered through this, you know the symptom. A previously quiet car suddenly sounds like it has several Harley engines propelling it down the street. It’s not dangerous, it’s just embarrassing to me. But not for my daughter, who giggles every time I accelerate from a stop. But it really got me thinking about trade-offs. What am I willing to forgo to stop sounding like the hot rod from hell? Would I give up a home improvement project? A summer trip? Buying yarn? Here’s a hint: You’ll hear me coming from blocks away, and you’ll know me by the yarn trailing out the car windows. Spring is the time when the frogs return and I’m suffering from a plague. Not of frogs, but of frogging. Inspired by one of my knitting/blogging heroes, Mary Scott Huff, I am learning stranded colorwork. I am also learning toe-up sock knitting. Both at the same time. Considering that any new technique will inevitably require at least two tries, plus an extra try to get the size/gauge right, I think I am now at my limit for starting over. Yup. Nothing but smooth sailing for this sock! Of course, some of the frogging is due to my inability to just follow a pattern as written (this applies to recipes as well). 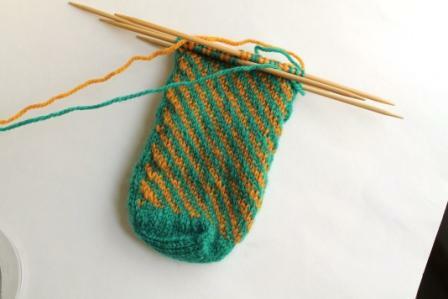 The pattern is for a Bosnian slipper sock, and it is part of a Craftsy class called Knit Sock Workshop. 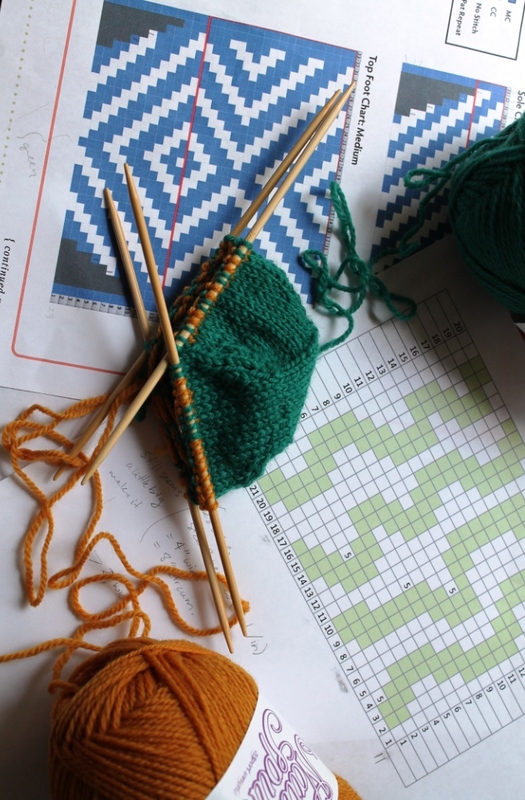 The colorwork pattern provided for the sock is a simple geometric stripe/diamond design–perfect for beginners. But, of course, why should I put all that time into a geometric design when I don’t really like it? I much prefer curves and organic shapes. So, I scoured Pinterest and started collecting charted designs. And then I had to take it a step further and mash ideas together using Excel spreadsheets to chart variation upon variation. And I finally designed a very nice swirl, took up my size 3 DPNs and blasted through the first 4 rounds of the body (the basic toe with increases was already done in a solid color). Now, the beauty of the toe-up sock is that you can actually stick your toe into it as you progress to check the size. 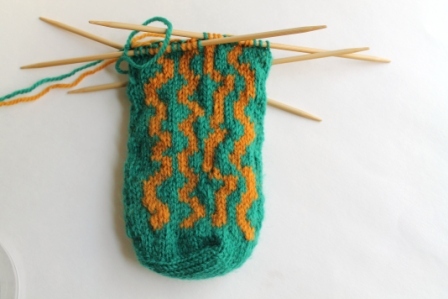 With each round I knitted onto the body of the sock, I felt more apprehensive about the size. So, I did it. I spread out the stitches on the needles and slipped my bare toes into the end. So, frogging I will go. I may have to drop down a needle size (yikes! size 2 toothpicks!) and I am also switching to a more simple charted design, one that will be easier to alter to the new dimensions. I’m calling it “noodles.” I hope frogs don’t like noodles. Just before frogging. Old design chart in blue and white. New noodles chart in green and white.